Unless you have a code, you may have difficulty getting in. The code is in the form a secret phone number which changes times to time. I can’t give you the phone number, but the address is 56 East Andrews Drive in Atlanta. Look for the larger complex it is hidden in marked “56 Cellar” or you might miss it. The doors are locked so step up to the London style phone booth to make a call, and it opens into a gateway which becomes Prohibition. The ambiance and décor combined with the staff’s utmost attention to service, knowledge and refined classic bartending style make Prohibition unforgettable. 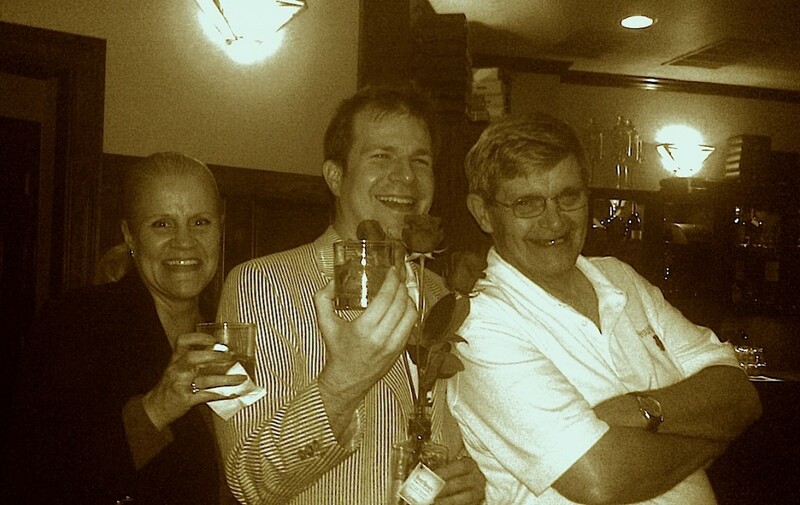 I’m visiting my friends from Four Roses Bourbon who are hosting a Bourbon tasting tonight at Prohibition. Just like BourbonBlog.com, they are in town for the Atlanta Food and Wine Festival 2011. My first pick for the evening is a Four Roses Small Batch Bourbon on well-crafted ice sphere that was freshly molded by the top level ice ball machine with a Macallan logo on the side of it (see simple video below that shows ice sphere being made and removed – shot from my camera phone). I join Al Young and Karen Kushner of Four Roses who are doing a special tasting and Al is singing and selling copies of his book Four Roses: The Return of a Whiskey Legend. From it’s mixability with cocktails that Prohibition is serving up to drinking Four Roses straight and appreciating the 10 unique recipes of Four Roses, both Al and Karen are here to sharing the good word of this Bourbon.